Piranha Plant Field (or Special Course 2) is the second special course in Super Mario Run. It can only be played after all of the Purple Coins in all compulsory levels are collected, and a Purple Coin Pipe is placed in Kingdom Builder. The level begins with a single warp pipe and a Goomba. Upon reaching the first set of warp pipes with Piranha Plants inside of them, the first Purple Coin is above on a semi-solid platform, and can be collected by ledge-grabbing a Brick Block. Afterwards, the player must wall jump between warp pipes while avoiding Piranha Plants, with the second Purple Coin at the end of the segment. More warp pipes and Piranha Plants appear, as well as a large gap with the third Purple Coin, which can be collected using the Super Star appearing on top of a higher warp pipe. The player must then use the Super Star to access a path below a semi-solid platform later on, taking out the Piranha Plants to obtain the fourth Purple Coin. 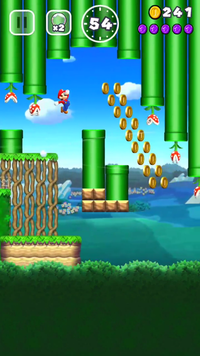 After a while, the player will reach a segment with vertical warp pipes, some with Piranha Plants, and should stick to the top part of the area to reach the fifth and final Purple Coin, on top of a warp pipe just before a semi-solid platform. After a few more warp pipes and Piranha Plants, the Goal Pole is reached. This page was last edited on February 10, 2019, at 22:08.